Give your typical lentil soup recipe extra life with chicken broth, spices and cream cheese. 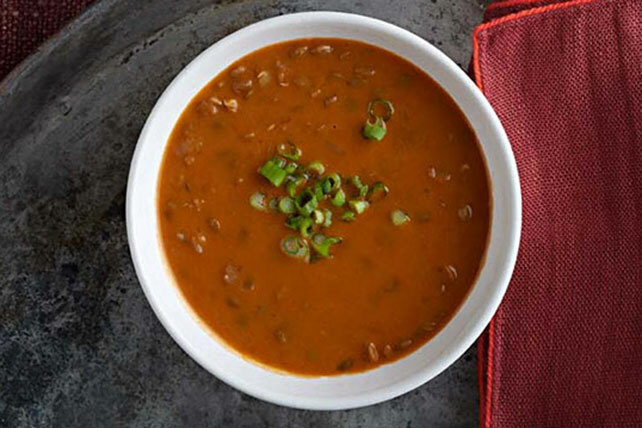 Try this Slow-Cooker Creamy Lentil Soup recipe for a delicious main. Melt butter in medium skillet on medium heat. Add onions; cook 8 min. or until tender, stirring frequently. Add to slow cooker. Stir in all remaining ingredients except cream cheese; cover with lid. Cook on LOW 7 to 8 hours (or on HIGH 3 to 4 hours) until lentils are tender. Add cream cheese; whisk until cream cheese is completely melted and soup is well blended. Garnish with sliced green onions or chopped fresh chives before serving.